Is you is or is you ain’t bad grammar? In a post at Lingua Franca a few months ago, Geoffrey Pullum made a useful distinction between Normal and Formal styles of English. He says “proper use of English is not defined by relentless use of Formal”, a fact that eludes those for whom correct English is coterminous with formal standard English. Unaware that correctness, far from being absolute, can vary with register, dialect and context, people end up taking against innocuous usages and non-existent errors that then impair their enjoyment of language. Their appreciation of music suffers too, because they hold song lyrics to the same restrictive standards as elevated writing. Certain lyrics are ungrammatical: I don’t dispute that. But people flip out over double negatives, omitted subjunctives, reflexive pronouns and the playful disregard of formal subject-verb agreement as though these implied illiteracy, laziness, stupidity or recklessness. Never mind dialectal sensitivity: not even poetic licence gets a look-in here. I dislike hearing the word ain’t in a song and sometimes an otherwise beautiful piece of music just grates when that word is used. Having been a teacher I guess to me it’s the grand daddy of bad grammer [sic]. But ain’t isn’t really a grammatical issue. Bad grammar and non-standard language, though commonly conflated, are not the same thing, as I said in a discussion on Grammar Girl’s blog last year. Bad grammar means something like “Goed us town.” I don’t think that’s grammatical in any variety of English, though we might hear goed from a child who has temporarily regularised a strong verb. There are rules of syntax and morphology that we pick up as infants and observe automatically, and there are “rules” – generally style or usage guidelines – that we’re taught later and that may be worth heeding in certain settings. But to many people, bad grammar and grammar errors simply mean any set of conventions in English that differ from the formal standard (or from their interpretation of it). In short: informal ≠ incorrect, and non-standard ≠ sub-standard. A particular kind of English – formal written style – is socially privileged, and sometimes it’s exalted at the expense of common sense or courtesy. Ignorance of these nuances means irrational peeves thrive, and people make a habit of collecting and hating everyday usages that don’t fit their narrow sense of what’s acceptable. English is replete with styles, dialects and sublanguages that are fully context-appropriate, and grammatical in their own right. They’re not what you’d use in a business letter or ceremonial speech, but why would they be? Different domains of expression have their own norms: it’s presumptuous and preposterous to impose one set on all others. Songwriters draw on genre conventions and their own dialects, both of which they may play with and subvert. Insisting on formal standard English all the time is like prescribing formal attire 24/7. It’s like saying E. E. Cummings ought to fix his formatting, or demanding that jazz obey 2/4 time. 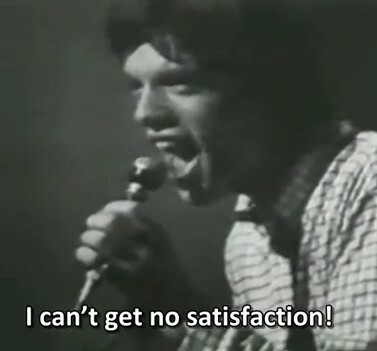 No wonder peevers can’t get no satisfaction. This entry was posted on Tuesday, June 19th, 2012 at 2:46 pm and is filed under dialect, grammar, language, music, usage, writing. You can follow any responses to this entry through the RSS 2.0 feed. You can leave a response, or trackback from your own site. 46 Responses to Is you is or is you ain’t bad grammar? I think subversion of standard forms and conventions is a key aspect of much of popular music. Rock and roll and many other popular genres are deliberately countercultural. In music that challenges social conventions, it only makes sense that the norms of standard, formal English would also be challenged. Joy: Thank you! Some picky grammatical points are worth picking, though the complaints often come bundled with an unpleasantly patronising tone. Many other language peeves have little or no basis. Jonathon: That’s a good point. Rock and roll in particular is intrinsically countercultural, so griping about Elvis Presley’s double negatives is doubly absurd. And I’ve been known to become a grammar nazi myself – I started a whole discussion about missing-subjunctives that confused a lot of people who had no idea that there even was a subjunctive in English (as illustrated by “if I were a rich man” from Fiddler on the Roof). So I suppose I shouldn’t get annoyed by the grammar nazis either, as I sometimes fall into that evil group! I’ve used normalized spelling, but the sounds you’d hear are closer to “aigs” for eggs, “dint” for didn’t, and “ax(ed)” for ask(ed). Of course, none of this is ungrammatical in the dialect in which it’s spoken. Gerry: It is a good example. It’s why I named the post as I did, and included a video of the song at the end. Oh, I see. I skipped straight on to the very interesting discussion without noticing the video. Loved this version of the song, hadn’t heard it before. Fascinating how people decry language usage that is different from their own. Recently a couple of fellow Aussies were complaining about that “awful Americanism ‘off of'”. A little research revealed that it was good Elizabethan English! Fascinating how people decry language usage that is different from their own. Indeed, and it’s something I look at fairly regularly here. A lot of dogma and confusion seem to spring from the mistaken idea that there is (and can be) only “one right way” – be it one way to pronounce a word, one version of a variable idiom, etc. Some people are weirdly reluctant to accept variation in language usage. Joy: I was reading a text recently with double spaces between sentences, and I referred the writer to Wikipedia’s extensive page on sentence spacing. My default preferences is for a single space, especially in text destined to be justified, but I don’t get wound up about it. Motivated Grammar has a good post on the subjunctive and its gradual decline. The fact that a lot of people you brought it up with had no idea of its existence is telling, though I imagine they use it at least sometimes. John: That is wonderful. Bless your Geek Answer Syndrome. The song was my obvious reference, though I also thought of the line in O Brother, Where Art Thou? : “Is you is, or is you ain’t, my constituency?” I didn’t know the song lyric alluded to something else, something particular. Is it an old comedy skit? I found a variation (involving raisins rather than eggs) at the foot of this page. ““Arn” in Newfoundland means ‘anyone’ or ‘any’. Its opposite is ‘narn’ which means ‘no one’ or ‘none’. One fisherman met another on the way back from the fishing grounds. A lovely succinct summary, Stan, thanks. The idea that songs should be expected to meet peevers’ grammatical wishlists is particularly odd, to me. Do they think that poetic licence is something that must be applied for by filling out a form, presumably in Formal Standard English? Stuart: That’s a good question! I think once pedantry is indulged for its own sake, instead of being used sparingly to serve clear communication, it’s at risk of becoming increasingly divorced from common sense. Child: Look, mum, twain ! We was in a twain, didn’t we ? Mother: No, Johnny, that’s not right: we was in a train, wasn’t we ? What’s striking to me about this post from an American perspective is how the examples you cite (as grammar changed according to context or artistic license) are drawing on a Southern American, particularly African American, argot–one that’s become internationally influential as rock ‘n’ roll spread. old gobbo: That’s a great example. I used to go out with a woman whose (UK) dialect had “we was” as the norm; I found it charming. I like that mismatched “didn’t we”, too. theeditorandthebeast: I chose some of those examples for that reason, but I didn’t foreground it because it involves sociolinguistic issues that would warrant a post of their own, and I’m perhaps not best placed to write it. But I don’t believe in judging people for their dialect, be they privileged, mainstream, minority, outsider or whatever. What people often forget about non-standard dialects is that they do have rules – just not the rules that govern the standard form of English that they use. William Labov showed that for what he called Black Vernacular English. People were dismissing it as ‘bad English’ when it turned out to be simply ‘different English’. And there are even differences between what is “standard”. I was once chastised by a Welsh woman for saying, “He just left” instead of “He has just left.” She insisted the present perfect had to be used in this instance and wouldn’t hear anything about how American English doesn’t require it. limr: Yes, exactly. They assume that the “rules of English” are the rules they know about, or were taught, and that deviations from this “norm” are necessarily inferior. It’s a cultural bias. Your experience with “just left” typifies this bias, and is similar to what I’ve seen occasionally happen when Irish people use idioms and pronunciations that aren’t part of standard BrE. I’ve linked before to Views of Standard English and I’m glad to do so again; the idea that standard English is uniform and universally agreed upon is very misleading. I suspect this Newfoundlander arn/narn is parallel to Appalachian traditional dialect ary one/nary one (pronounced “airy’un” and “nairy’un”). You’re so right – there is a big difference between mis-using language for artistic or poetic reasons (or even to fit in with a certain group) and committing grammatical errors. I think sometimes people forget that communication is the most important thing! John: Thank you, I wasn’t aware of that connection. I passed on the information in a comment at WWW’s blog, though it hasn’t appeared yet. Lauren: Yes, I think they often do forget it, in their rush to criticise. A lot of the time it’s not even misuse, just different use. Thanks for your visit! @Joy: It might (or not) interest you to know that many linguists (Geoff Pullum for one) doesn’t consider “if I were” to be subjunctive at all.Check this post for details). “We was” and “he were” are both possible in British English – in different regions, obviously. Both have regularized the past of “be”, but they’ve chosen different forms. Interesting. Pullum calls it the “irrealis” tense – but an unreal wish is what the subjunctive is used for, at least in French, which is the only other language I speak. Seeing it in writing, in your comment, “aren’t I” looked all wrong! I had to think about it for a while, and then I realized that of course that would indeed be what I’d say instead of “ain’t.” It’s sort of curious that the contraction is correct, but without a contraction it seems so wrong that you describe it as “profoundly” ungrammatical! Karen, Joy: This is one reason I’m glad to have amn’t in my idiolect. It’s very common in Ireland; took a while before I realised how unusual it is worldwide. There’s a good way to think about language: there are (at least) 3 levels) in which we communicate: first, colloquial, informal, vulgar (in the old sense), where strict rules of grammar and syntax are less important than conveying messages. We use that level when we talk to friends, family, the cat, texting (though that may be at an even lower (i.e., simpler) level. In the middle is “business formal” (or some such name), where the rules come to the fore. We use that in writing that we expect will be read by others – especially in resumes – or in giving a spoken presentation to an audience. At the top is “strictly formal” (or maybe “academic”), in which the rules are very important, which is what statesmen and politicians use when speaking to millions. (Unfortunately, that also leaves out a lot of the heart and soul of the message). The problem comes when we – or somebody – insists that we conform to a higher level than the communication needs. lectorconstans: Normal/Formal is a still broader division some linguists make to distinguish between the two main modes. Of course, each bleeds into the other, and all are subject to constant flux. Even on very formal occasions those speeches from top politicians and diplomats (a less sexist term than statesmen) may include colloquialisms as a way of establishing rapport with a general audience. I don’t think lower registers are “simpler” than higher ones, though. By “simpler”, I just meant the the vocabulary is usually simpler, sentences are shorter, &c.
“statesman” –> “statesperson” –> “statespersibling” … It’s all just a PC attack on straightforward language . “Statesman” defines a different territory than either “politician” or “diplomat”. The three definitions may include some common ground (as in a Venn diagram), but I would reserve the term “statesman” to someone who has shown exceptional ability and influence. Like, for example, George C.Marshall and Margaret Thatcher. No, it isn’t “all just a PC attack on straightforward language”. It is language being adapted to keep step with less chauvinist ways of thinking. Parodic terms such as statespersibling are a red herring; political correctness is about respect and consideration for others. No one is talking about avoiding all references to gender. But gender is often irrelevant in a given context, so we can choose to avoid the use of sexist and limiting terms. I’m not sure I’d consider “Congressman” – referring to a general person – as “sexist”. Evidently not. But many people would, and there are alternatives. Love aint about genders. Is that a correct grammar? It’s informal, not ungrammatical. I explain all this in the post, if you read it.